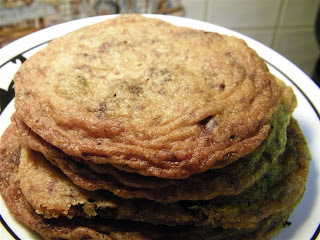 I halved the recipe, and while they weren't bad, they were almost too buttery (I know, how can such a thing be possible? ), and they spread way too much for my liking. Upon reading the comments from the other TWD Bakers, I realized I was not the only one with the spreading problem. Some people like the thin, crispy cookies, but I prefer mine not to spread so much. Many bakers suggested either decreasing the butter, or increasing the flour. If I make these again, I'll probably cut back on the amount of butter used. However, it's likely that I'll try a different recipe first! They definitely filled the chocolate-fix requirement though, and didn't last long! Be sure to check out what the other TWD bakers did with this week's recipe!! Well, as long as they satisfied the chocolate craving! I thought mine were too thin too, but they were fairly chewy, so I was okay with it. Even though they look great, I relate on the too thin sentiment. I made this one over a year ago so I decided to make a few other recipes and do a taste test instead. Wow - you and I definitely were on the same thought track this week. I think they were good, but not the best. Of course, that didn't stop me from eating them!